Experiencing problems with component supply for EZL-50M(A) we highly recommend CSE-M53N for new system. 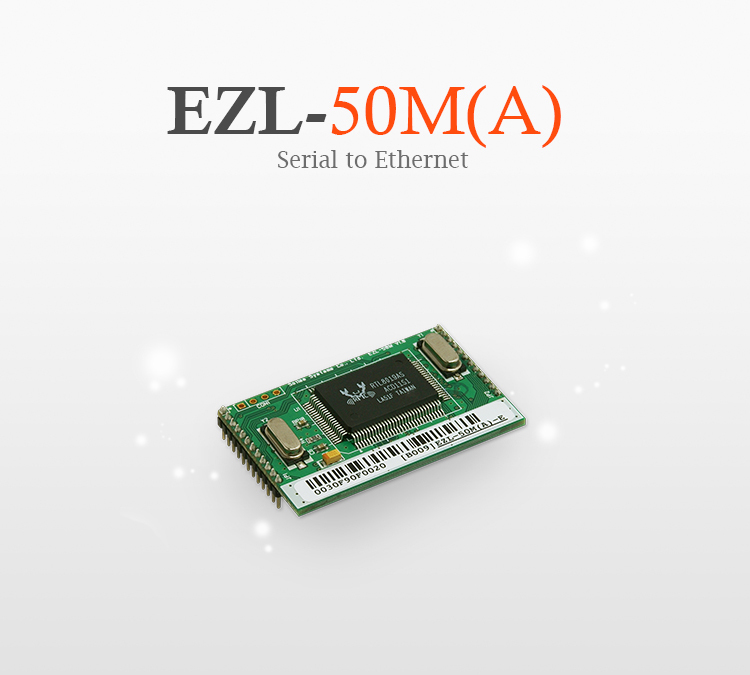 EZL-50M(A) is an embedded serial to Ethernet module that offers conversion functions (serial to TCP/IP and vice versa) to provide a serial device with seamless network connectivity. Therefore, this module enables your serial device to be remotely controlled and managed over network without changing legacy software. This serial to Ethernet module comes equipped with the highly accumulated TCP/IP technology supporting 10Base-T Ethernet. EZL-50M(A) offers various communication modes (TCP Server, TCP Client and UDP) and security functions (IP filtering and password), along with a UART port which can be extended to RS232/RS422/RS485. EZL-50M(A) can be applied in various communication environments such as Central Remote Patient Monitoring System, Power Management System, Mobile Terminal Testing Equipment, etc.